Christianity and the American Revolution: Did You Know? Don’t be surprised if you find yourself surprised. Peter Muhlenberg gave perhaps the most dramatic sermon of the Revolutionary era. Chronology of some events related to the American Revolution. What did the founding fathers really believe? Chaplains had one of the toughest jobs in the Continental Army. 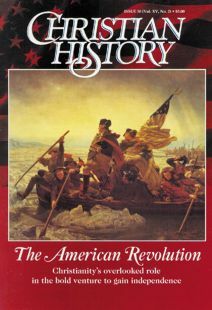 More resources about Christianity and the American Revolution.